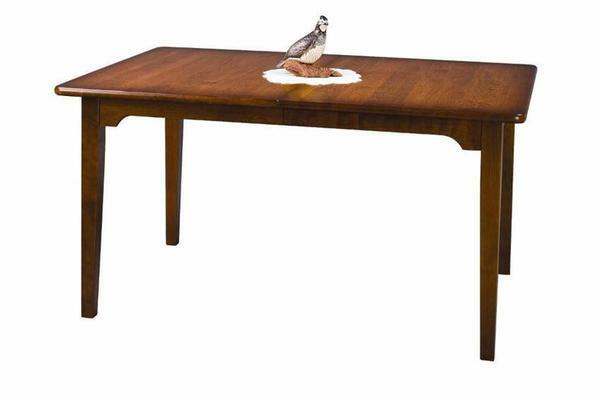 This Meredith Dining Table is custom made for each customer. Pick your options to create your dream farmhouse custom table. First you choose your table dimension. Then you choose how many extensions you would like for your new table. Center Table Legs have One Bolt Anchor and are Easily Removed. Then you choose the wood you would like your table made in. Choose your table leg styles. 44" W x 72" L is not available in 36" Height. Choose your table skirt style. Note that most arm chairs don't fit under the table skirt. Please call with questions on the many options for this farmhouse table. You can reach an Amish furniture specialist at 1-866-272-6773. End Width Between Legs: 24 3/4"
Side Width Between Legs: 45 3/4"
Note: Most arm chairs don't fit under the table skirt. 42" W x 64" L x 30" H - End Width Between Legs: 30 3/4" and Side Width Between Legs: 53"
42" W x 64" L x 36" H - End Width Between Legs: 30 3/4" and Side Width Between Legs: 53"
44" W x 72" L x 30" H - - End Width Between Legs: 30 3/4" and Side Width Between Legs: 60"
44" W x 72" L x 36" H - - End Width Between Legs: 30 3/4" and Side Width Between Legs: 60"
We received the delivery of our beautiful cherry farmhouse table (with shaker chairs) over the weekend. Thank you for such beautifully crafted furniture. Your driver was wonderful. He kept in touch to let us know exactly when he would be coming and everything went smoothly. It will be wonderful to have the farmhouse table for my daughter's 1st First Communion party. I would certainly recommend your company to my friends and hope to order future furniture from you.